Join your neighbors, and have "Coffee With a Cop" on Thursday, April 12th from 7-9 AM or between 4-6 PM at the Starbucks located at 26585 Golden Valley Road, Santa Clarita. "There is no set agenda. 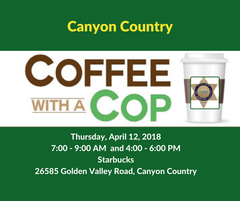 Residents or business owners are welcome to stop by and say hello, ask a question, or voice a concern" said Canyon Country Crime Prevention Unit Deputy Jon Wilson,"We believe that having good communication is very important to developing strong partnerships with our community members. Working together, we can combat crime."